Always wanted a Jeep. Drove one in the Marine Corps in 1972. I am going to fix this one (not muck work to do), and go around Houston and Cypress Texas, plus enter it in the Veterans Day Parade in downtown Houston. Larry's Comment: Would like to see more of your Jeep, Jimmy. From the picture it looks like an early CJ3A flat fendered Willys. You can you use the "Comment" section below to give a bit more detail i.e., model, year, original or upgrades, condition, etc. if you will. Either way your Jeep looks like it is in pretty good condition...from what I can see of it. Thanks! 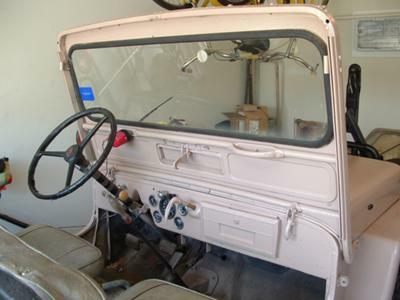 This a 1946 CJ2A that has had some CJ3A parts put on it like the windshield. This Jeep has a ser # CJ2A 24946, Body Ser# same and a Tub # 15677. Will take some more pictures after I get it running again. Water pump starter and a few other minor things needed. Thanks for your comment.